If I close my eyes, I can smell tangy citrus mingling with the aroma of warm butterscotch. A feathery light, golden yellow cake appears in my mind, glistening with a sweet drizzly glaze, sparkling with lemon zest – my mother’s unique and lovely Lemon Bundt Cake. My mother, Evelyn, cooked with the hands of her mother before her, and her mother’s mother before that. Flavors, methods, timing so ingrained, memories and tradition moving seamlessly from generation to generation. No written recipes required. So, while I like to imagine I am the kind of baker who can exactly replicate flavors from memory, my cake is a second runner up to Mom’s. 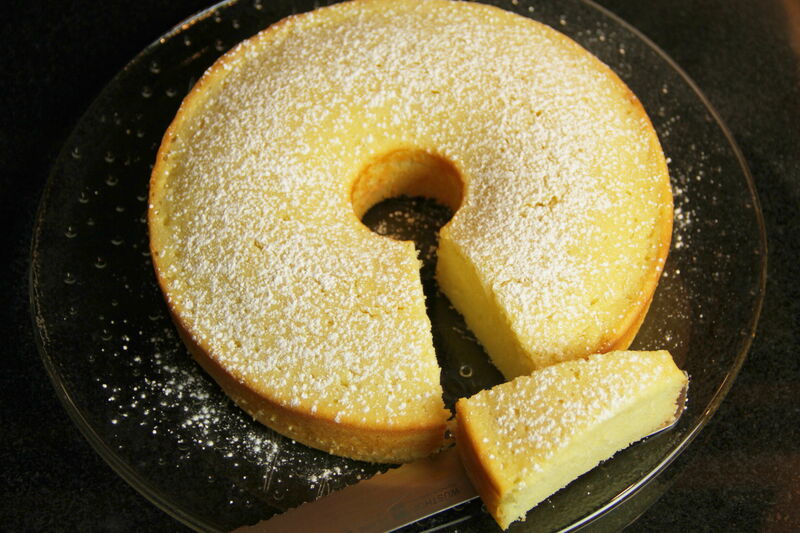 Nevertheless, this cake is permeated with pure, fresh lemon juice and intriguing bits of tangy rind. Nothing more than a dusting of powdered sugar is needed to finish this moist, golden bundt. If you like, a sweet confectionary glaze with just-squeezed lemon juice is also lovely sometimes. 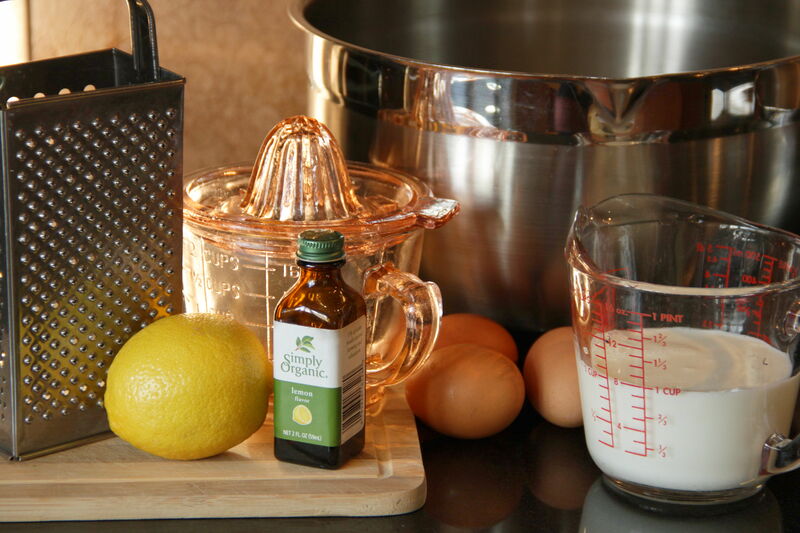 To make the glaze, pour some powdered sugar into a bowl (start with ½ cup and make more as needed) and add just enough lemon juice to make a thick but pourable substance. 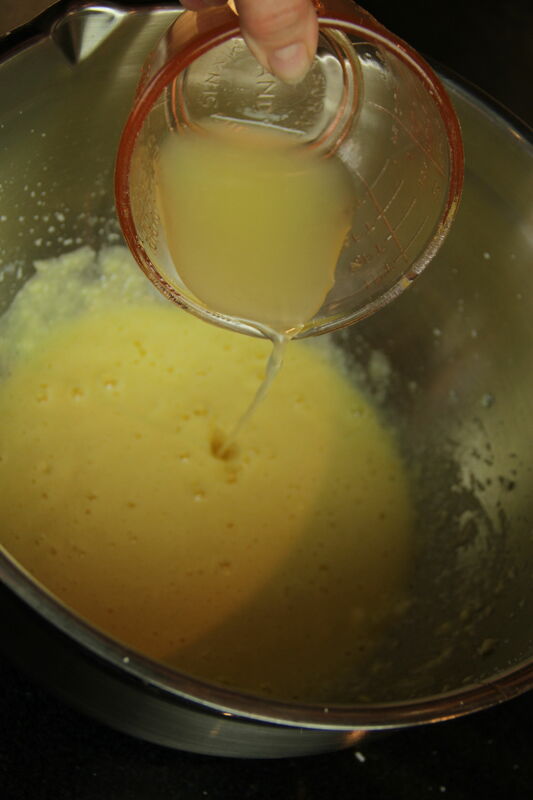 Pour the liquid on top of the cake, and allow it to drizzle down the sides a little without touching the plate. When set (wait at least 30 minutes), the sweet, drippy patterns are nearly irresistible and add a touch of elegance to this simple cake. In the morning, delicately toast a slice or two and serve them with hot tea or coffee for a memorable breakfast in bed. In large bowl, cream together butter and sugar. Add eggs and mix well. 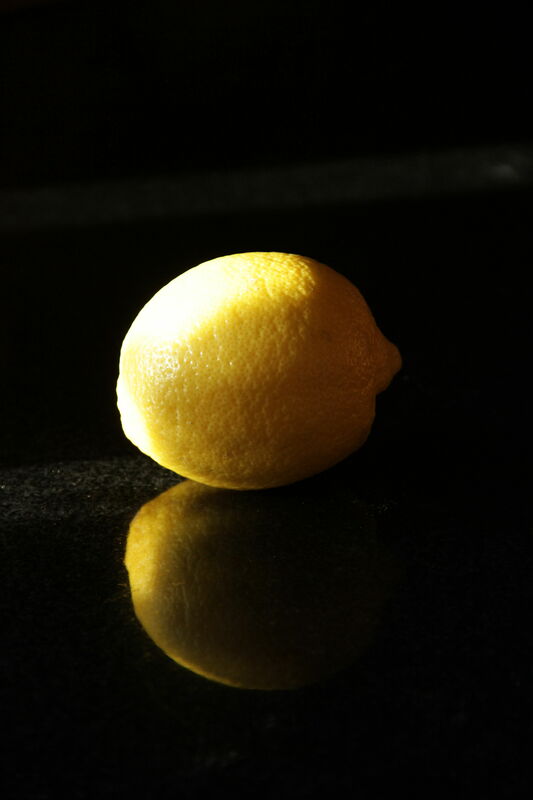 Stir in lemon juice, rind and oil. Sift together flour, baking powder, baking soda and salt. Add dry ingredients to batter, alternating with milk, stirring gently after each addition until batter is thick and creamy. 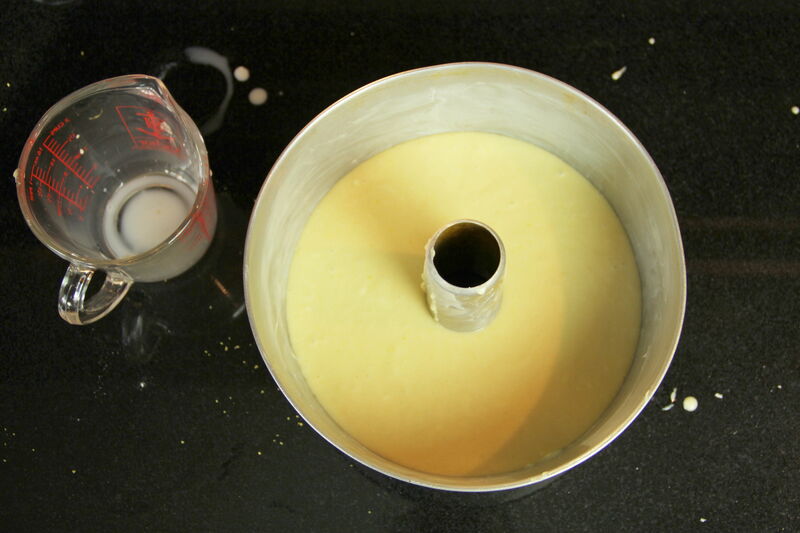 Pour batter into greased tube pan. Bake at 350° for 45 minutes or until toothpick inserted in center comes out clean. Let cool for 10 minutes in pan before inverting. Sprinkle with powdered sugar, or cover with lemon glaze. Artichokes, whose dusty green sharp-leaved plants protect their tender succulent centers, are actually a species of thistle. They are native to the Mediterranean area, and have been cultivated as food since at least the ancient Greek and Roman periods. Somehow, they made their way through Spain into France, then to the US in the 19th century – to California by Spanish immigrants and to Louisiana by the French. If you’ve every painstakingly worked your way through dozens and dozens of spiky outer leaves to reveal the thistly choke-protected base of an artichoke, then diligently scraped away the tiny, splintery bracts to reach the exquisite, savory heart, and nibbled your way through that delicious, delicate orb, you’ll know why these thistles are beloved the world over. These days, artichoke rounds can be purchased already cleaned and stacked neatly in cans making it simple to indulge in this delicacy on a daily basis. Artichokes are rich in antioxidants and low in calories. Gently warmed, topped with a poached egg and a sprinkling of buttered bread crumbs, Artichoke eggs make a tender, succulent breakfast in bed. 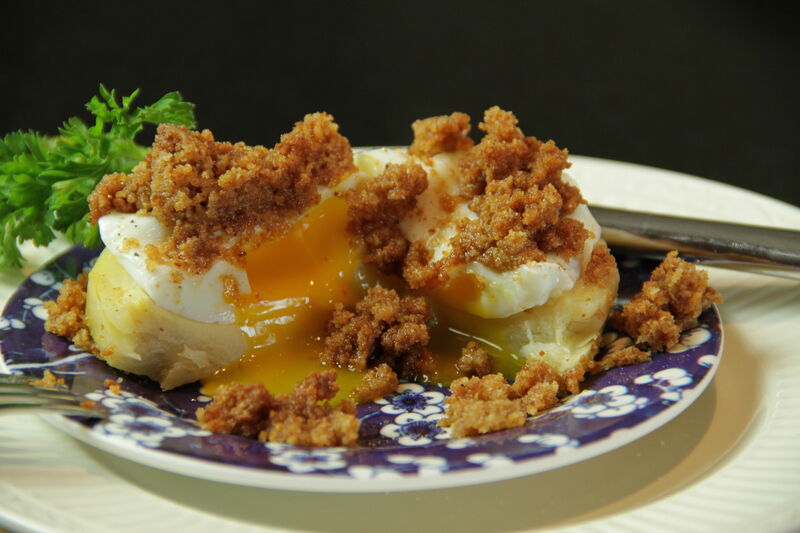 Heat artichoke bottoms in a slow oven and keep warm while preparing eggs and breadcrumbs. 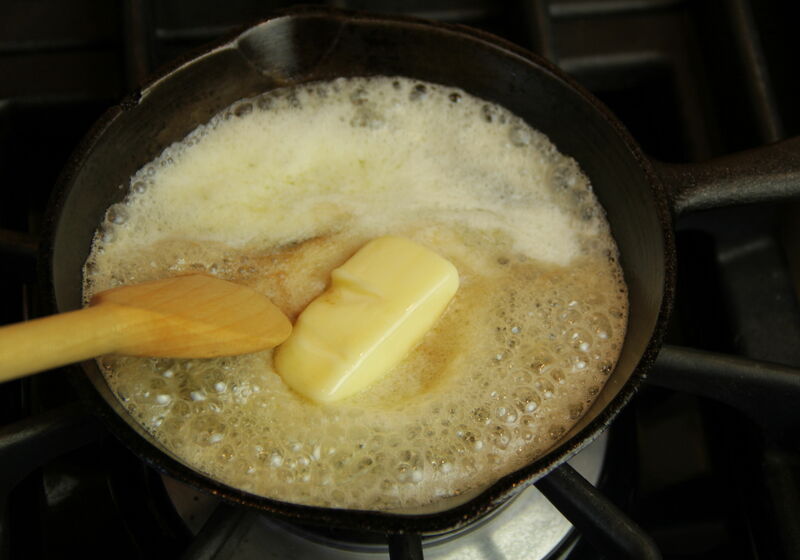 Melt butter in heavy saucepan and continue to cook until browned. 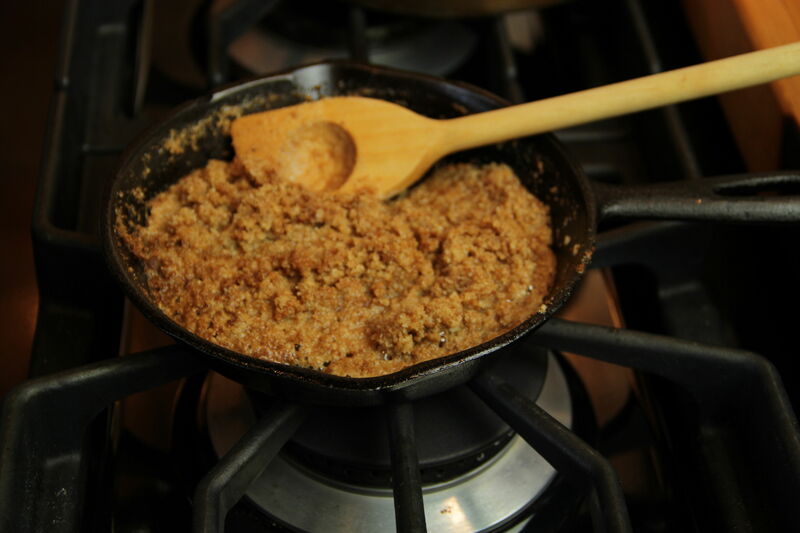 Add breadcrumbs and continue to cook until crispy, another minute or two. Set aside. 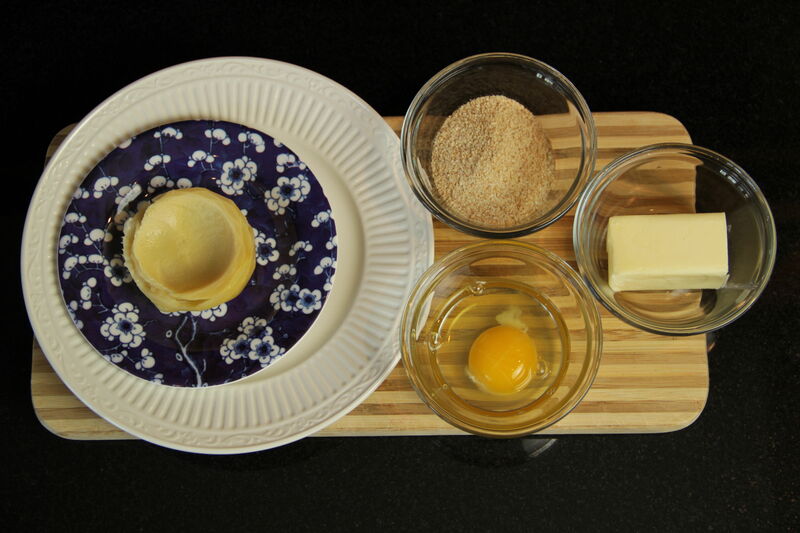 Place each egg on top of an artichoke bottom. Season with salt and pepper to taste. 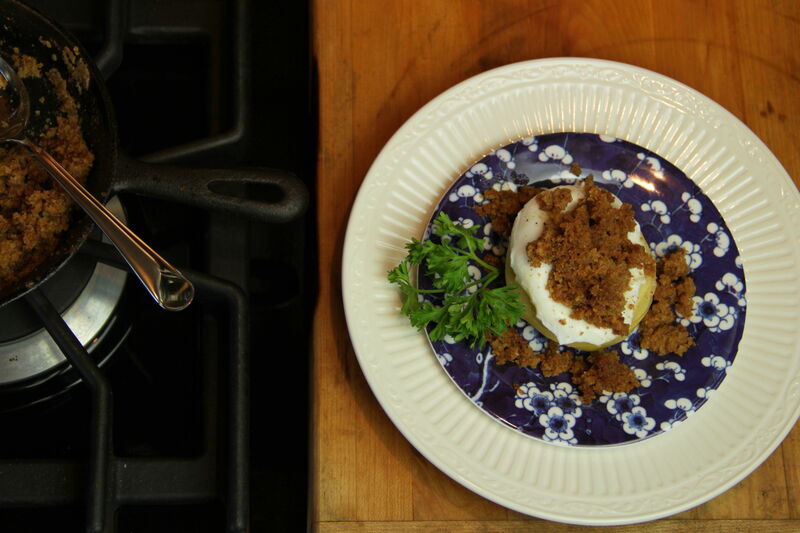 Sprinkle with buttered breadcrumbs and serve immediately. Word of warning to parents/readers of books to children: DON’T OPEN IT. IT’S A TRAP You will be bound to saying some very silly things out loud if you read it. 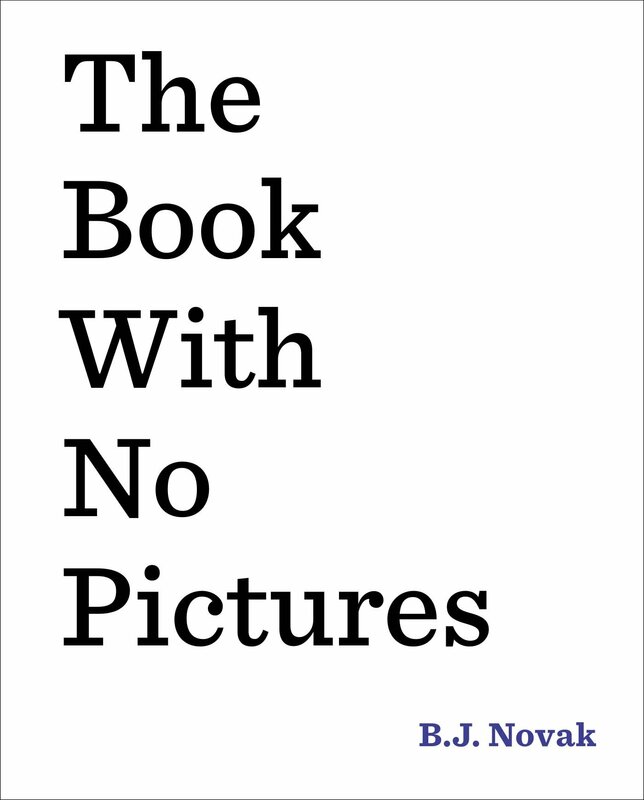 True to its title, this book has no pictures but that won’t stop kids from clamoring to have it read to them over and over. The premise of this book is that the words can be as fun as the pictures, if handled correctly. See, whoever reads the book out loud HAS to say what the words tell him to say. Even if the book makes the reader say, “I am a monkey using my monkey mouth to read!” the reader is bound by the laws of book-reading to say this out loud. -Wait! I didn’t want to say that! Don’t make me read any more! I’ve read this twice in as many days to my son and he’s read it once to me so far. It’s a good concept. It reminds me of Mo Willems’s We Are In a Book! in which the characters have a moment of clarity in which they discover they are in a book and use the opportunity to make the reader say “Banana”. To kids, this is hands-down the funnies part of the whole book. Good concept to build on. I think if you are an authority figure it’s even more fun. You get to see the teacher say, “My head is made of blueberry pizza!” Definitely worth a read or six. With winter weather upon us, there’s no better time to break out the plaids. I love how these understated geometrics mingle well with checks, stripes, or even florals. A plaid-on-plaid scheme might sound buttoned-up, but a room can appear cheerful, fun, and even whimisical depending on the colors selected. 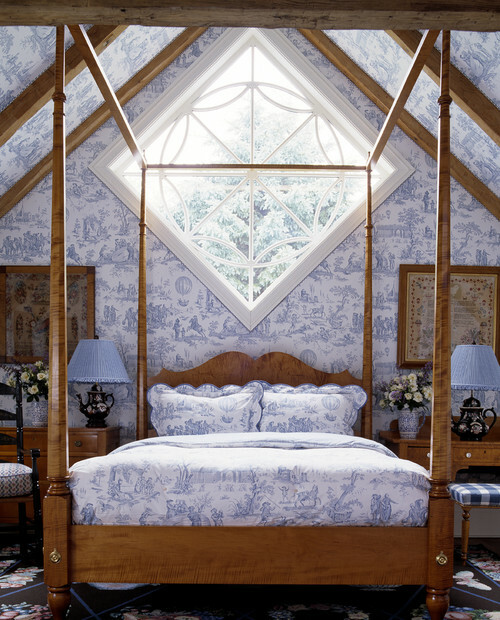 Get inspired by these five fab bedrooms with plaids. 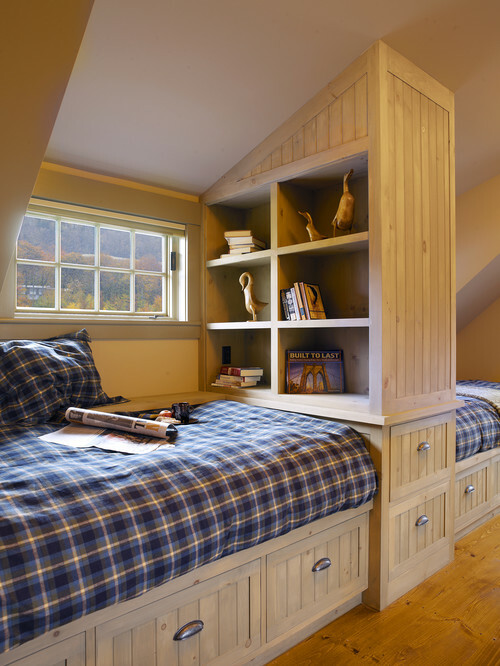 This comfy, cottage-like twin room is a space saver with built-in shelving and beds. 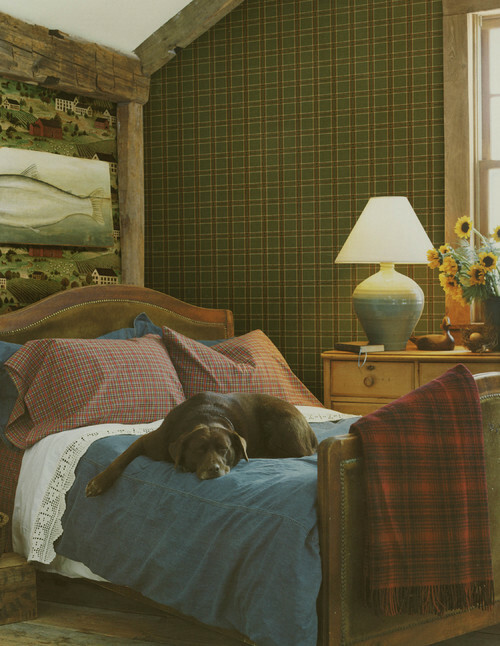 The plaid gives a slight grown-up feel to the compact hideaway, which is perfect for boys of any age. 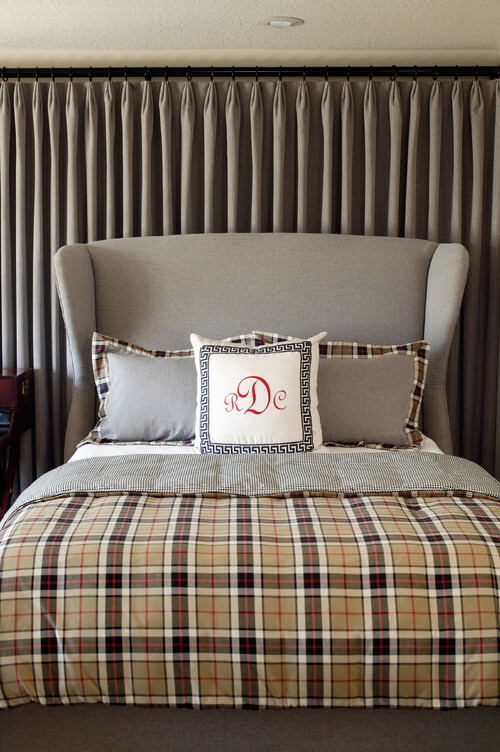 A darling Burberry plaid covers this sweet bed. Plaid-flanged shams coordinate nicely. 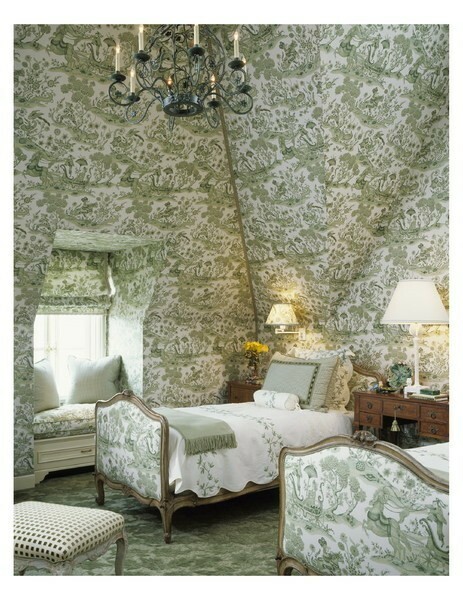 Notice the ticking on the reverse side of the comforter. 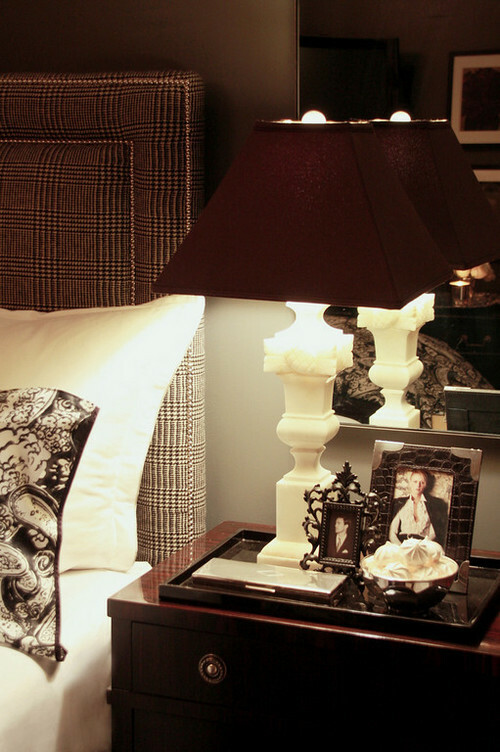 The monogrammed Greek key accent pillow completes the look. Who doesn’t adore a good plaid on the windows? 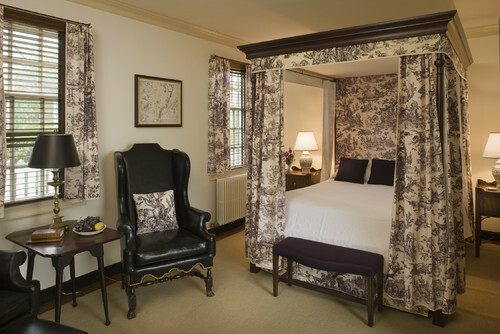 Roman shades, side panels, and pillow shams are done up right in plaid. 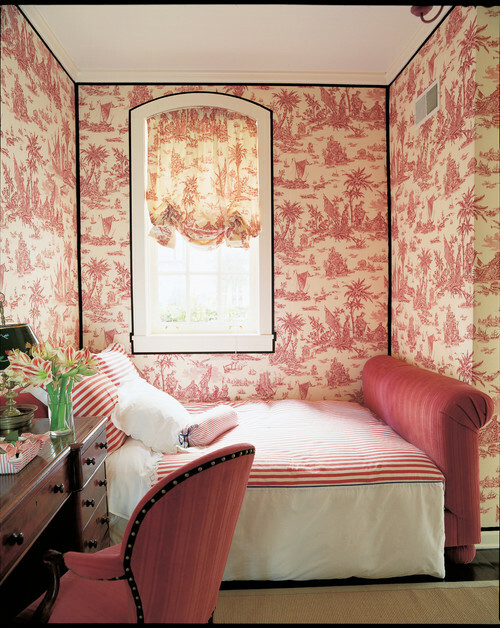 A botanical rug provides contrast and a touch of femininity. Although not a likely color combination, the blue and brown create a calming space ideal for rest. 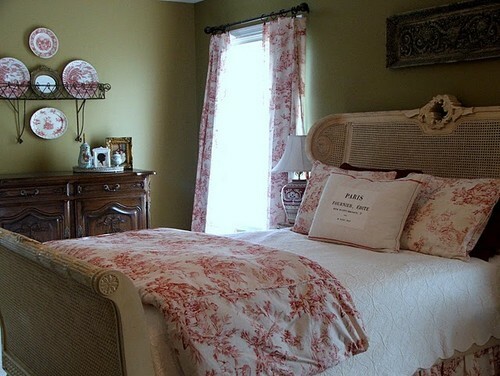 I bet you’re oohing and aahing at this clean and elegant bedroom. I am. 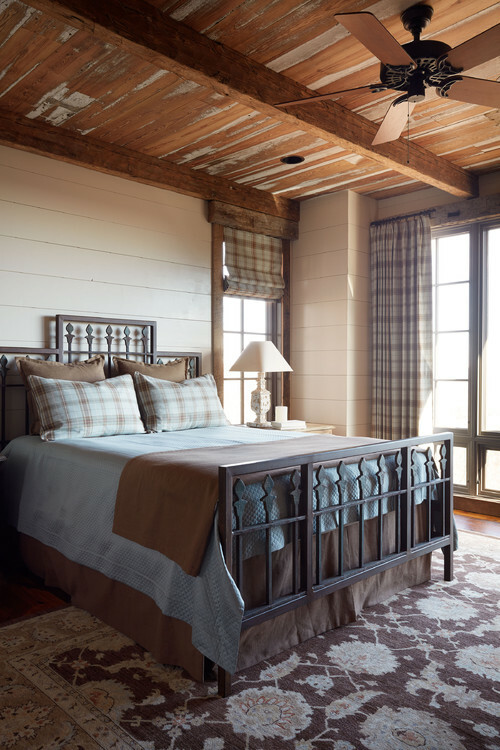 Brown and white tartan covers the structured headboard, the shams wear a fun pattern, and the accessories are clean and classic. Here’s an example of mixed plaids in different scales and colors, and they work beautifully. There’s nothing I dislike about this room, but my favorite accessory happens to be asleep on the bed.